Professor Murray Jennex is an information systems whiz. He would start his classes on Information Security and Decision Support Systems with an open and frank discussion on relevant current affairs. During one of these discussions he raised a question regarding the accuracy of the information on wikipedia. Yes, it is open so that the entries can be vandalized; yes, Stephen Colbert did prove that point well. Do not underestimate the knowledgeable Professor Wiki! 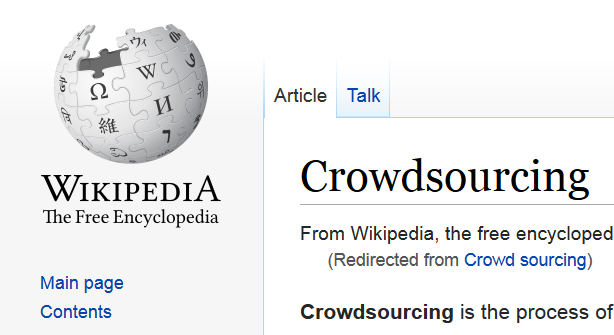 Surprisingly, people have done an amazing job in correcting the mistakes on wikipedia and thanks to the power of the crowd, wikipedia remains one of the most current sources of information. In one study, ~73% of vandalist revisions on wikipedia were fixed within 1000 seconds! There! That is the power of crowd sourcing that Prof. Jennex was trying to convey! However, it never crossed my mind that this power could potentially be harnessed in order to keep abreast with biomedical research. But, it is always on the minds of many people geniuses in the Su Lab. Imagine if every gene in biomedical literature had a wikipedia entry and that each entry was current and thorough. Although it’s quite a lofty dream, it could happen. If researchers were to take five minutes out of their day to add their knowledge to Gene Wiki, it could definitely happen. So, my brilliant, biomedical research buddies…what are you waiting for?